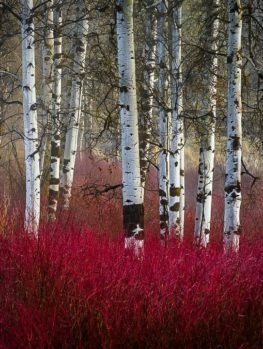 The Dogwoods are a large and diverse group of shrubs and small trees that bring a great deal of beauty and utility to any garden. There are two main types of dogwood, so we have split their description into two. Here we consider the smaller, shrubby plants, and elsewhere – as Dogwood Trees – we describe the beautiful flowering trees in this group, trees that are very different and distinctive from their shrubby cousins. Dogwood shrubs are some of the most useful garden plants around. Easy to grow, largely trouble-free, and versatile, they form part of the backbone of the planting of almost any garden. Cold resistant, they are vital additions to the gardens of those who live in the colder parts of the country. Lovers of water, they provide useful plants for difficult parts of your property. Colorful in winter, they brighten the dullest weeks of the year. All in all, it is hard to imagine a worthwhile garden that doesn’t include some of these plants, to give variety and interest. The most striking feature of these plants – and the one that makes them so garden worthy – is the color of their winter twigs. In dramatic shades of red or yellow, depending on the variety, these lighten up the winter garden as nothing else can. Seen against the dark earth of winter, or rising above the whitest snowfall, they tell us that nature is not dead, just sleeping, waiting to return with color and interest, while we enjoy the beauty of these unexpected colorful branches. This is not all there is, because in fall they turn rich shades of crimson, and some have variegated summer foliage too, to brighten that season. It is hard to know where to begin with recommendations for growing these plants, because they have so much to offer. Since the focus is mainly on winter effect, they are excellent planted behind perennial flowers, or smaller shrubs. They create a calming and neutral background through the growing season, and then, with nothing in front anymore, they stand out all winter long. Plant these shrubs as part of the foundation planting around your home. They will contrast well with the different evergreens that are typically used for that part of the garden, and their upright branches and larger leaves in summer show off the finer foliage of the evergreens, and vice-versa. Every garden has beds to fill with easy-care plants, so that we can focus our limited time on the plants that are a little harder to grow, so Dogwood Shrubs are ideal for this purpose. Grown as single plants in smaller gardens, or in groups of three or five – or even more – in larger ones, they are essential. Their winter hardiness makes these plants outstanding if you garden in colder areas. They are happy even when the mercury falls to minus 50, so if that sounds like your winters, it’s time to start planting. Not only are they cold resistant, but they offer us great plants for those areas that are always a problem – the low-lying damp or wet spots in the garden. Unlike many shrubs, they thrive in damp and wet soil, which is after all where they grow in nature, so this is not surprising. If you have a pond, or are lucky enough to have a stream or even be on a lake, then you simply must plant these shrubs by the water. They will be right at home, and you will love how they look in their natural setting, especially when the water freezes and their rich colors sparkle against that white, icy backdrop. Another use is as a low, informal screen to divide one area from another, or to mark your property line. Since they will grow in sun or partial shade, this can even be through lightly wooded areas, natural land, or wet areas. These are easy plants for anyone to grow. They are hardy to minus 50, placing them in zone 2. 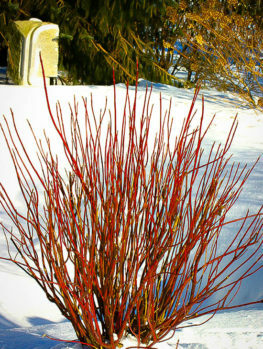 The Variegated Red Twig Dogwood is not quite so hardy – although surviving minus 40 can hardly be considered ‘tender’. They will also grow in the mild climate of zones 8 and 9, which means that unless you live in Southern Florida or coastal Southern California, these shrubs will grow in your garden. Especially in colder areas, where the choice of plants is more limited, these beauties give gardeners lots of choices to fill the garden with interest, especially during the long winter months. The love the sun, which gives the sturdiest growth and the best twig colors, but they are perfectly happy growing in partial shade too. So they are versatile around the garden, demanding very little, but delivering a lot. As for soil, they are not particular. Dry sandy soil is not ideal, but otherwise they grow well in any kind of soil, including heavy clay, where many other plants fail. They also grow well in wet ground, so even that will not deter them. In fact, they thrive in those wet conditions, making them ideal choices for streams and alongside lakes. In the first season after planting, make sure you water regularly – weekly except in winter, and perhaps twice a week if the weather is very hot and dry. After that these plants are moderately drought tolerant, but they will always appreciate a long, slow drink when the weather is hot and dry – have one yourself while you are at it. Apart from some pruning, discussed later, no particular care at all is needed for this plants to grow well in your garden. Some compost or organic mulch over the roots is beneficial, but not essential. A little fertilizer in early spring will be appreciated, but again it is not a requirement. There are no particular pests or diseases very likely to appear, and even deer leave these plants alone. That last feature is a big bonus if you are in rural areas where deer are common. What are Dogwood Shrubs Like? 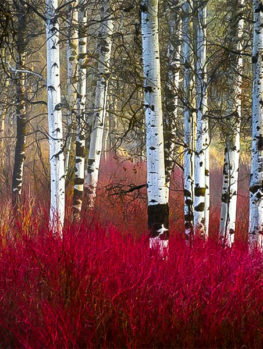 Dogwoods, or as botanists call them, Cornus, are a group of nearly 60 shrubs and trees that grow around the world, mostly in northern regions, in Europe, North America and Asia. They are technically divided into four sub-groups, but the groups of interest to gardeners are just two, with a couple of oddities added in. 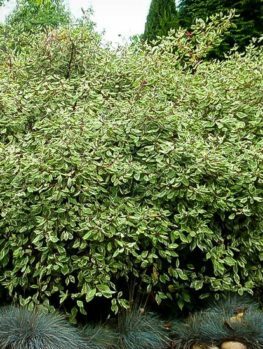 The group we are considering here is mostly deciduous shrubby plants growing 3 to 8 feet tall, with clusters of small white flowers and white or blue berries in fall. The younger twigs are often colorful. The other group are small trees, with large white or pink flowers and with red berries. This second group – important as specimen trees – is discussed on our site as Dogwood Trees. Dogwood Shrubs are deciduous shrubs with the leaves in pairs along the stems (‘opposite’ leaves). The leaves are oval in form, tapering to an elegant point. They are 2 to 4 inches long, with a smooth surface. 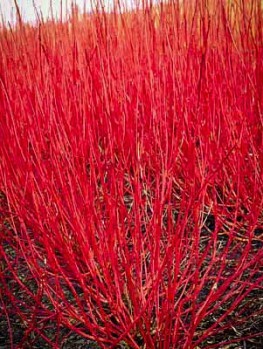 They are a mid-green color, but a striking variety, the Variegated Red Twig Dogwood, has leaves with a broad margin colored creamy-white. Although the leaves are usually green, in fall they turn stunning shades of reds, often very dark crimson, and look spectacular. This adds to their usefulness and interest in the garden, blending with all the other wonderful tree colors that make fall such a special season. 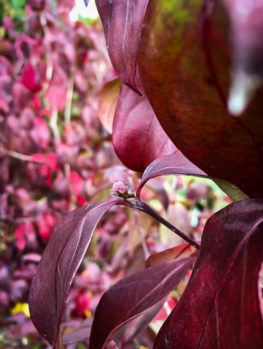 Only the Variegated Red Twig Dogwood does not have these dramatic fall tones, but it does of course hold it variegation until the leaves drop quietly to the ground. These shrubs all have upright twigs, and form dense, twiggy clumps, also spreading sideways a little underground. The can sometimes grow to 10 feet tall if left untrimmed, but most grow more modestly, reaching perhaps 6 or 8 feet tall untrimmed. In most gardens they are trimmed regularly, to develop good twig color, so they only reach 3 to 5 feet tall with that treatment. Regularly pruned plants do not flower a great deal, but the flowers are modest clusters about 2 inches across of many tiny creamy-white flowers. These often develop into clusters of white berries, sometimes flushed with blue – an unusual color in berries. These berries are about a ¼ inch across, and sadly do not last long, as they are soon taken by hungry birds. Of the 20 or so species in this group, only two or three closely-related ones are grown in gardens. These represent three continents, and they are Cornus alba from Siberia and northern China; Cornus sericea from North America and Canada; and Cornus sanguinea from Europe. This last one is in the words of one gardening authority, “Undistinguished”, and is rarely seen. That leaves just two, and some experts consider them to be merely branches of the same species. So from a gardeners viewpoint, only details distinguish them. When berries appear they are suddenly easy to tell apart, as the Chinese Cornus alba has blue berries – a real treat to see – while the American Cornus sericea has white berries. Much more important are the various garden varieties, which are notable for the different colors of their twigs in winter, and sometimes for having variegated foliage. The main differences between the different garden forms of these shrubs are in twig color, and size. All are handsome garden plants that bring a real lift to the lowest season the year – winter. Although planting native species is high on many gardener’s list, in this age of the environment, many are still surprised to discover that this plant is indeed a native shrub, growing naturally across our country from Alaska to Newfoundland, as well as south into Colorado and east to Virginia. In the wild it is usually seen along the banks of streams and lakes, but it adapts well to garden conditions and grow happily in regular garden soil. 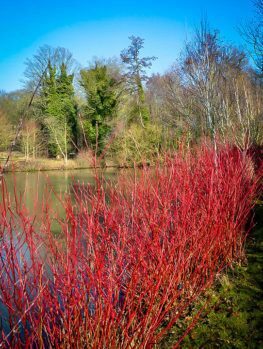 Although an attractive green-leafed shrub, with quietly charming flowers and berries, it is in winter that this plant comes to the foreground, with its dramatic red twigs sparking in the winter sunlight, and standing out especially well against a snowy backdrop. 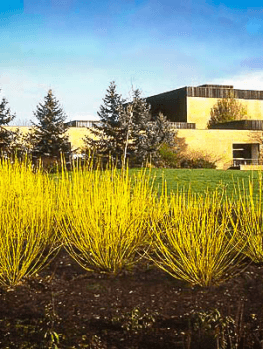 As the name suggests, the Yellow Twig Dogwood has striking yellow winter twigs make this plant unique among the dogwoods. It is a special form of the North American species, and it is called Cornus sericea ‘Flaviramea’. Not surprisingly, it looks very much like the Red Twig Dogwood, with similar leaves, and the same flowers and white berries. These are not often formed in gardens. This plant has been with us for a long time. It was developed by the German botanist and nurseryman Franz Ludwig Späth in 1899, at his garden outside Berlin. From there it was introduced across Europe and into America. 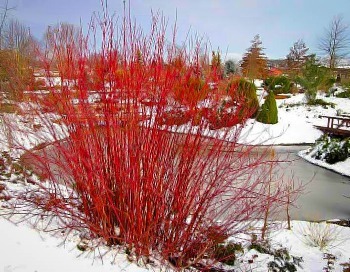 It is especially beautiful when planted with the Red Twig form, making a dramatic winter contrast and then blending together when they are in leaf during the summer months. This shrub is a ‘two-for-one special’ in the garden. Not only does it have handsome leaves, each with a broad margin of creamy-white, but when they fall the red twigs are revealed, giving winter color. 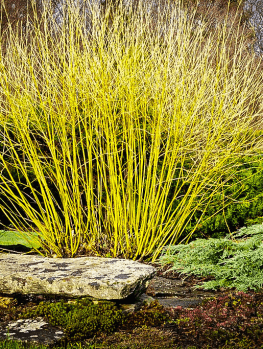 The variegation brings light and brilliance to the garden, while the twigs – a little darker in color than the plain red-twig dogwood – bring interest at a time when there is little of that in most gardens. 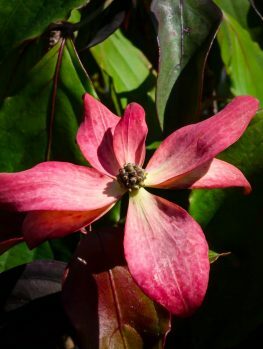 Although very similar in overall appearance to the other dogwoods, this is a form of the Chinese species, and is called Cornus alba ‘Elegantissima’. The difference shows up most strikingly in the blue, not white berries that can develop. The green-leafed plant itself was introduced from Siberia as early as 1741, but the origin of this variegated form has been lost, although it was probably found in the late 19th century, as it was already winning awards by 1900. 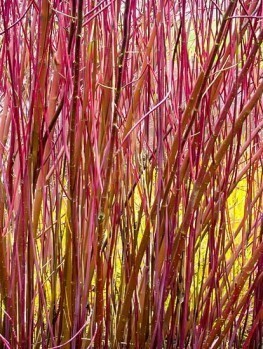 The Bailey’s Red Twig Dogwood is a form of the American Red Twig. It features lighter red twigs, and a more compact, denser growth habit. Called Cornus sericea ‘Baileyi’, we no longer know who Bailey was, but his or her plant was first described in 1892. 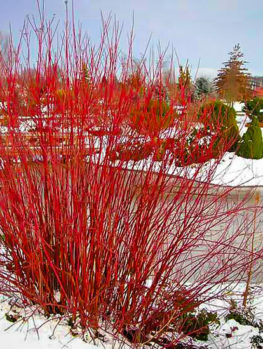 The Arctic Fire™ Dogwood is a new variety that is truly a dwarf form, growing to no more than 4 feet in height. It makes it easier now for people with smaller gardens to fit these great winter plants into their limited space. It was discovered and developed this century by Mick Farrow, a plant breeder form Holly Hill Farms, Earleville, Maryland. Perhaps not surprisingly, its full name is Cornus sericea ‘Farrow’. It has the same bright red winter twigs, but on a much more compact plant. Water the pot thoroughly the night before planting. The organic material you use can be garden compost, rotted animal manure, rotted leaves, or peat moss. Mix this into the soil to a depth of 8 – 12 inches. Once you have done this, dig a hole that is the same depth as the pot, and several inches wider. Follow the instructions above to finish this simple task. During the first growing season, water at least once a week, and more if the weather is very hot and dry. Growth will always be lusher and fuller if your plants receive sufficient water, so using a mulch, and watering during dry weather is worthwhile. Once established, your plants will be resistant to normal periods of summer drought conditions, and they need no special care. Of course, if you have planted your Dogwood Shrubs in wet soil, there will be no need to water them at all. These plants are very low-maintenance and will grow happily if simply planted and left alone. However, after a few years they will become tall, and the older stems and branches will develop brown bark, so that only the younger growth is red or yellow. Therefore you might feel that some pruning is a good idea to control the size and to encourage as much color as possible. There are two ways to do this. This simplest is to just wait until your plants become too tall and overgrown, and then cut them right down to the ground in late winter. Just leave a couple of inches of stem showing above the ground. As the spring comes, so will new growth from the base, and within the year you will have 2 feet or more of colorful stems will have developed. These can be left to grow more, and in a few years, simply repeat the process of cutting right to the ground. In colder areas, where growth is not so vigorous, or if you don’t want to see that gap in your beds for a whole season, then simply remove a few of the oldest branches at ground level each year, again in late winter. This will encourage new shoots from the base, and your plant will stay shorter, and always look attractive and bright. Don’t simply shorten longer shoots back a little, or trim with hedge shears, as this will not encourage strong, brightly-colored shoots.